Europe's particle physics lab, Cern, is losing ground rapidly in the race to discover the elusive Higgs boson, or "God particle", its US rival claims. The particle, whose existence has been predicted by theoreticians, would help to explain why matter has mass. Finding the Higgs is a major goal of Cern's Large Hadron Collider (LHC). 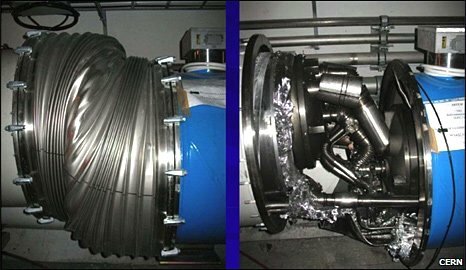 But the US Fermilab says the odds of its Tevatron accelerator detecting the famed particle first are now 50-50 at worst, and up to 96% at best. Both machines hope to see evidence of the Higgs by colliding sub-atomic matter at very high speeds. If it exists, the Higgs should emerge from the debris. The LHC has been out of action since last September when an accident damaged some of the magnets that make up its giant colliding ring. Project leader Lyn Evans conceded the enforced downtime might cost the European lab one of the biggest prizes in physics. Cern and Fermilab officials squared up at the American Association for the Advancement of Science (AAAS) annual meeting in Chicago. Identifying the so-called God Particle has been a target for the European Organization for Nuclear Research (Cern) ever since the LHC was first conceived in the early 1980s. At the launch of the LHC near Geneva in September, some scientists predicted the Higgs would be revealed as soon as summer 2009. But just one week later, an accident occurred which will halt experiments at the accelerator for at least 12 months. Fermilab has taken advantage, cranking up the intensity of research at their Tevatron accelerator in Illinois. Director Pier Oddone presented the Tevatron's latest data at the AAAS meeting. "We now have a very, very good chance that we will see hints of the Higgs before the LHC will," said his Fermilab colleague, Dr Dmitri Denisov. "I think we have the next two years to find it, based on the start date Lyn Evans has told us. "And by that time we expect to say something very strong. "The probability of our discovering the Higgs is very good - 90% if it is in the high mass range. "And the chances are even higher - 96% - if its mass is around 170GeV (giga-electron volts). "In that case we would be talking about seeing hints of the Higgs by this summer." The smaller the mass of the particle, the more difficult and time-consuming it will be for Fermilab to detect. But even at the lowest end of the range, the chances are "50% or above", according to Mr Oddone. 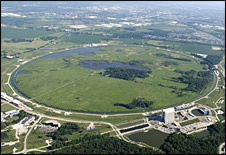 "Tevatron is running extremely well. We are in the peak of our shape," added Dr Denisov. "We are increasing our data-set very quickly. And they are feeling the heat. "Instead of having their usual Christmas break - of two months - [LHC scientists] are planning to run all the way through. "It's a race. Whoever is first is first." Fermilab estimates that the Tevatron has already picked out about eight collision events which may be hints of the Higgs. But until the number crunching is done, it is not possible to distinguish these from "background noise". Sitting shoulder-to-shoulder with Dr Denisov was his counterpart Professor Lyn Evans, LHC project leader. "The race is on," he told BBC News. "The Tevatron is working better than I ever imagined it could. They are accumulating data like mad. "The setback with the LHC has given them an extra time window. And they certainly will make the most of it. "If they do find the Higgs, good luck to them. But I think it's unlikely they will find it before the LHC comes online. They may well be in a position to get a hint of the Higgs but I don't think they'll be in a position to discover it. "And of course, if it's not in the mass range they think it is, they have no chance of discovering it at all. Pier Oddone put the odds at 50-50 but I think it's less than that. "In one year, we will be competitive. After that, we will swamp them." The competition was healthy for "both parties", added Professor Evans. Though missing out on the Higgs would be a "sour consolation", he admitted. "The trouble is, the LHC has been sold on being built for the Higgs. "But don't forget, there is also a whole spectrum of physics to be investigated at the LHC which the Tevatron can never do." What happened to the Big Bang machine?